Featured Image: Mayan piramid clip art. CREDIT: aztec baktun (science) SOURCE: www.baktun.org (Public Domain0. Altar, worship house and sacred sundial—to ancient Maya, natural wells called cenotes were all these and more. Diving in a cenote near Chichén Itzá, photographer Paul Nicklen snaps pictures of National Geographic Emerging Explorer and underwater archaeologist Guillermo de Anda as he explores an otherworld strewn with Maya offerings, from pottery to human bones. Featured Image: Lost City in the jungle. SOURCE Unknown. 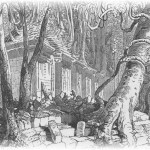 Dig a LITTLE DEEPER THEI Archive: “Lost Cities“. December 14, 2012—In a cave in Mexico’s Yucatán, a National Geographic explorer reveals what is believed to have been an underground observatory for witnessing the zenith passage of the sun. Just one more amazing solar observatory from an extremely advanced civilization. While doomsayers are predicting the end of the world nine days from now, there is an exclusive group of adolescents who are too busy celebrating to notice them. They are the children born on Dec. 12, 2000. They are celebrating their 12th birthdays today — the 12th day of the 12th month of 2012. This triple-12 date has inspired everything from a “12-12-12” fundraiser for Hurricane Sandy victims by celebrities at New York’s Madison Square Garden, to a “Maya Marriage of Many” on Mayan ruins in Belize. 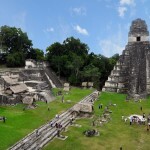 ScienceDaily (Nov. 12, 2012) — After emerging sometime before 1000 BC, the Maya rose to become the most advanced Pre-Columbian society in the Americas, thriving in jungle cities of tens of thousands of people, such as the one in Guatemala’s Tikal National Park. But after reaching its peak between 250 and 900 AD, the Maya civilization began to wane and exactly why has been an enduring mystery to scientists. Evidence of the miserable life lived by the Maya during the Spanish conquest of the 16th century has emerged in an ancient settlement of Mexico’s east coast, as archaeologists unearthed dozens of infant skeletons with signs of malnutrition and acute anemia. 3:22PM EST November 15. 2012 – A $15 million museum has opened in Cancun, just in time for the end of the world. 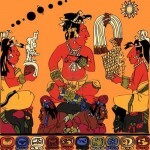 ScienceDaily (Oct. 3, 2012) — Archaeologists in Guatemala have discovered the tomb of Lady K’abel, a seventh-century Maya Holy Snake Lord considered one of the great queens of Classic Maya civilization.